I’ve been working on another project plus attending Gary’s preliminary hearing so I haven’t been able to update VoC for a while. On March 25/07 the Crown dropped the charges against two OPP officers discussed in this article. It was fully expected since this is the Crown’s new tactic in combatting CANACE attempts to hold native protesters and OPP officers accountable to the law. Lawyers in the courtroom were watching, and one personally expressed his surprise at the Crown’s decision to Gary McHale & Jeff Parkinson afterwards. Expect an application for a Judicial Review to be filed. Today, CANACE co-founder Jeff Parkinson was interviewed by a Hamilton Spectator reporter regarding his now-successful two-year (almost) quest to use the private prosecution provisions of the Criminal Code to lay Mischief charges against two OPP officers who assisted native protesters in building a barricade to keep the deeded owner out of his Hagersville development site during an illegal occupation on May 23/07. The Spec informed Jeff they have confirmed with the OPP that two officers are facing charges. They are scheduled to appear in a Cayuga court on Wednesday, March 25/09. I have watched for the last two years as you have persisted in seeking justice for the outrageous spectacle of police officers not only NOT protecting the lawful owner of the property, but actively assisting native protesters as they commit their crimes. 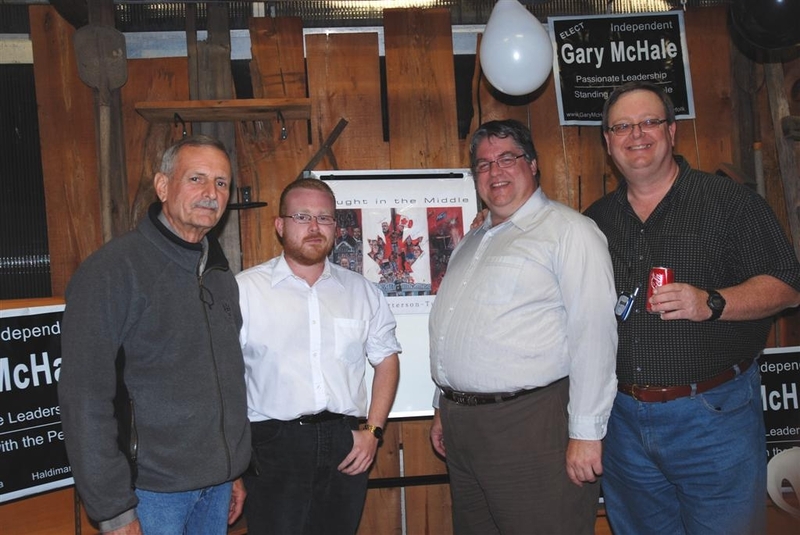 CANACE founders on election night, Oct 14/08; from L to R: Merlyn Kinrade, Jeff Parkinson, Gary McHale, Mark Vandermaas. Mary-Lou LaPratte not shown. Most people would have given up long ago, but you and Gary refused to do so in the face of determined opposition from the ‘best’ legal minds taxpayers’ money could buy for the Attorney General’s office. Your perseverence and legal research convinced Judge Marshall to create two important legal precedents that have paved the way to ending racial policing in Ontario, precedents that mean ordinary citizens can now do what Parliament intended with private prosecutions: hold those in positions of power accountable for their conduct. Yesterday, I got word from Gary McHale that the Crown has agreed to drop its opposition to a new hearing into charges against a native protester who assaulted police on Dec 01/07. The Crown had originally convinced the Justice of the Peace that the OPP could lay their own charges if they wished to do so, so this turnaround is remarkable. No one should be allowed to lay a hand on a police officer; they protect us, and we all have a duty to protect them — especially if their commanders and the politicians refuse to do so. Parkinson v. R. makes it possible for us to meet our obligation to seek justice for those who serve and protect us. What is remarkable to me is that you and Gary stood alone at the front of the courtroom against the OPP/Attorney General juggernaut and made history with no lawyers by your sides, armed only with determination, a vision of truth and of justice, and some legal knowledge gathered from Internet research. I was there on Jan 12/09 when Judge Marshall read his decision. There were tears in my eyes and in the eyes of Caledonia residents when we realized that justice does yet live in Ontario. People facing landclaim lawlessness and race-based policing in Caledonia and elsewhere in Ontario should take heart that the system will work and is working. The wheels of justice turn slowly, but they are taking us to a better time when the rights of all human beings in Ontario are respected, no matter what their race. Congratulations to both you and Gary. Thank you for doing this for me, for Caledonia, for Ontario and for Canada. I know the adjective ‘heroic’ might make you uncomfortable when applied to your actions in defence of justice and accountability, but that is the word that comes to my mind over and over again as I contemplate your accomplishments. I am so proud to know you and work with you. Be sure to read Gary McHale’s next column in The Regional News when it hits the street next Wednesday (March 25/09); it will have more details on this remarkable story. Gary’s columns are also available at www.caledoniawakeupcall.com following publication in the Regional which does not publish an online edition. Scroll down to the Regional News This Week logo. It should be noted that these charges were certified after both the OPP Professional Standards Bureau and the Ontario Civilian Commission on Police Services (OCCPS) refused to investigate them. So far, CANACE founders have succeeded in laying charges against native protesters and now, frontline officers. I wouldn’t be surprised to find that senior OPP officers and politicians will be next. The charges against native protesters were dropped by the Crown, but replaced with two other Mischief charges by the OPP after they had steadfastly refused to lay them. Meanwhile, the developers of the Cayuga townhouse site who asked for our help finished their work without further occupations. In the case of these two OPP officers I share Jeff’s hope that the charges will serve as a catalyst in motivating other officers to tell their leaders they will not have any part in carrying out illegal orders. At the very least, I suspect that no OPP officer will ever again be caught on video assisting native protesters in committing crimes. Although I am pleased that we now have a powerful legal precedent in Parkinson v. R. to take on those in the police or government who abdicate their duties to protect innocent citizens, it is sad to me that it all was so necessary. It is a sign of how far Ontario has fallen when ‘ordinary’ citizens with no resources are forced to defend democracy in the face of misfeasance by public officials. The beauty of democracy, however, is that ‘citizen-schlubs’ can pursue justice and change without ever picking up a weapon. This entry was posted in CANACE, CANACE News, Courage & Sacrifice, Leadership, MUST SEE, Native Protests - Hagersville, One Law for All!. Bookmark the permalink. My cynicism of OPP/crown morality would be diminished if the cowardly cretin that coldcocked Jeff, when he was not looking, and knocked him unconcious for no justifiable reason, owned up to it and faced the remedies that the law prescribes for such criminal conduct in peace officers. Until that day, I regard them as little more than Dolton’s personal goon boys.